Deeiogee, kind of a weird name right? Dee-oi-gee, Dee-oi-gee, D-o-g, oooohhh I get it! My name spells out DOG, hardy har har! Luckily I have a great sense of humor. In fact, with me around you will always have a smile on your face. I know I always have one on mine! 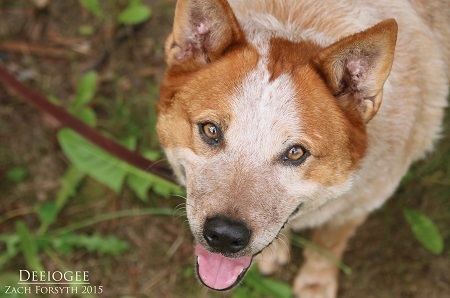 I am a happy, affectionate 8 year old Heeler mix who is going to make a wonderful family companion. Not only am I superb with people of all ages, but I get along great with other dogs too! I have to admit, though, I’m a bit overweight and need a home that will help me with an exercise routine. It is summer after all and there is a red speedo out there with my name on it! Ha! And you don’t get a belly like mine from being wildly hyperactive, so it’s safe to say that overall I’m a laid back, mellow boy. Is that a personality trait that suits your family? Then fill out an adoption application so we can schedule a meet and greet! I am fixed, vaccinated and microchipped. My adoption fee is $250.